Calvin Sidey is an old cowboy who abandoned his two children when his wife, Pauline, died. He’s living out in an old trailer, estranged from almost everyone who knew him. His son, Bill, asks him come to his house for a week or so to keep an eye on the kids while Bill’s wife, Marjorie, has surgery. What follows is quite an eventful visit from Grandpa. His 17-year-old granddaughter, Ann, is receiving unwanted attention from an old boyfriend and his 11-year-old grandson, Will, is trying to avoid a confrontation with his rowdy friends. Calvin may be old but he’s the same tough, no-nonsense man of his youth who hasn’t stopped living the Old West cowboy beliefs. 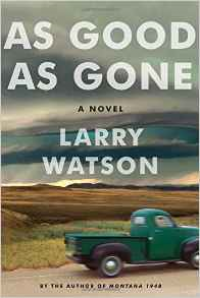 I’ve only read one other Larry Watson book, “Orchard”, and based on that experience, I had expected something much darker. This is written in a lighter manner with quite a bit of humor throughout. That’s not to say that it doesn’t have its suspenseful moments. The author is an expert at bringing his characters to life. He writes down-to-earth, very true-to-life stories and is a gifted storyteller. I couldn’t help but root for Calvin even as I cringed at some of his decisions. I loved each and every one of these characters and hated to see the book end. I will definitely be finding some time to read more of this author’s work and am very glad I was given a copy of this one. It’s funny, sad and suspenseful. Recommended.